So despite the fact that I live in Canada, where it's cold for a good 7 months (at least), I am a total beach bum. I've lived down the street from a beach my whole life, and I swear saltwater runs through my veins... okay, my beach is on a freshwater lake, but saltwater just has a nicer ring to it. Anyyyyways, I'm a beach bum, and what does every good beach bum need? Sunscreen. My personal fave is Sun Bum. It works well, makes my skin feel amazing, smells like a tropical vacation in a bottle. 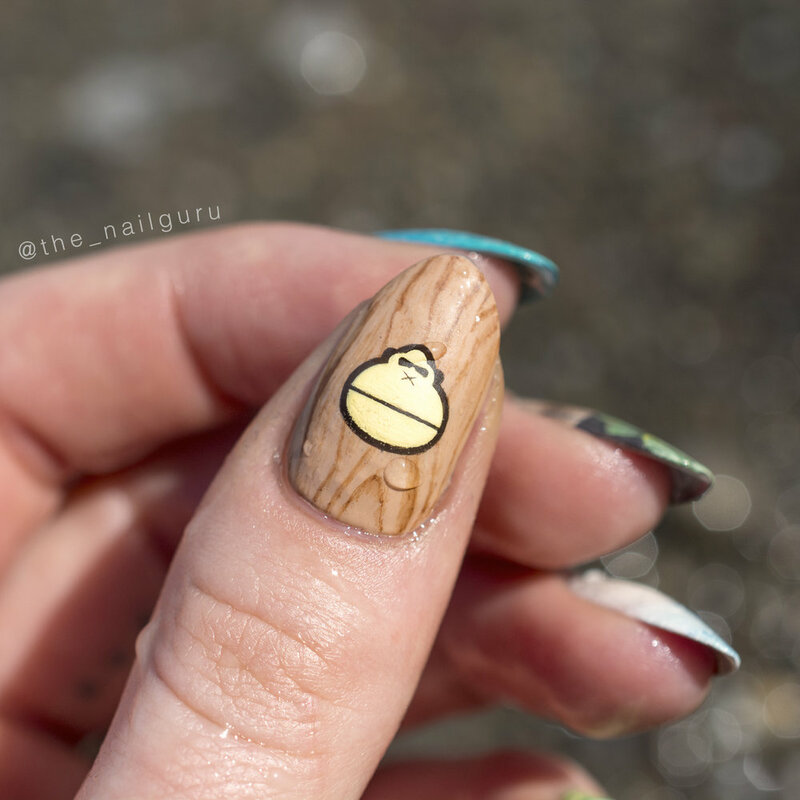 I figured that the world should know about my love for Sun Bum, so I painted their mascot, Sonny on my nails along with some tropical nail art. Starting with my thumb, I used a mix of Chantal from Zoya and Suzi Loves Cowboys from OPI for the base. Then, using watered down brown acrylic, I gently dragged it along the nail to create the wood grain. Sonny is painted with acrylic. For my pointer finger, the base is Guava from Barry M. with Purity from Zoya water-spotted over top. I added some additional water ripples with white acrylic. Moving on to my ring finger, the sandy base was a mix of Purity and Chantal, and then I painted the palm shadow and fine details with acrylic. Finally, my pinkie finger was a mix of Darcy from Zoya and Purity which faded out to just Purity. 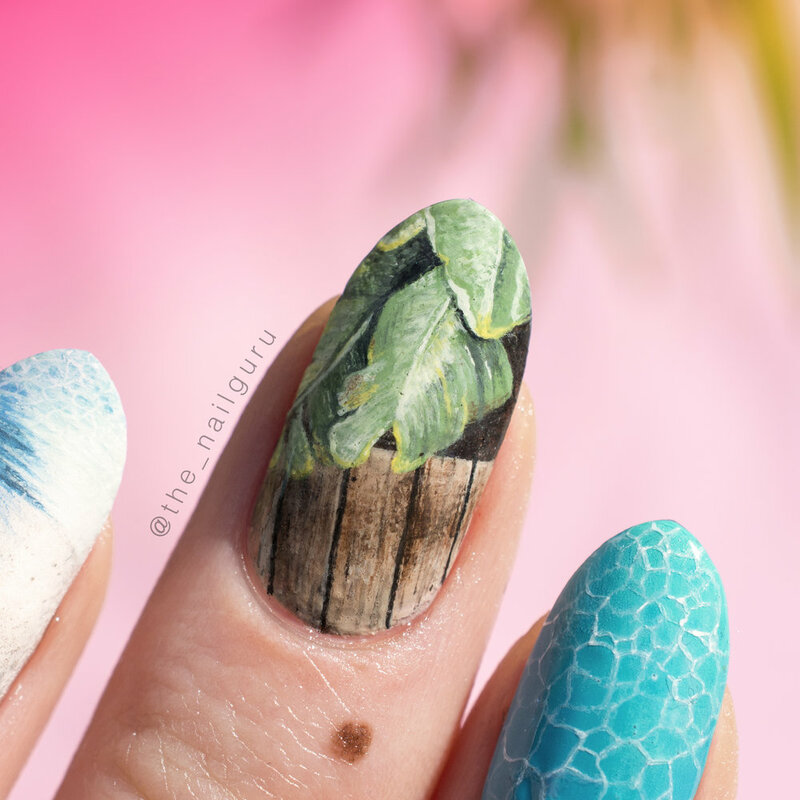 The leaves are painted with acrylic. Since my nails were all tropical and beach themed, I figured I had to actually take them to the beach.